Lord, give more joy to your church…Without the church, the whole world is joyless and miserable, and there is no end to hunger and thirst. I hate to disappoint you, but the Bible is not about you. Specifically, it was not written to improve the quality of your daily existence (in the way you think). It is not a spiritual handbook and it is not a guide to determining God’s will for your life. The Bible is not a story of God determining in eternity past to send His Son to earth to create a more satisfactory existence for you. But, this is usually where we take the story. We are seriously self-absorbed when it comes to our Bibles. Who else could take the unbelievable episode of Moses and the burning bush and bend it back toward our everyday experience? Or, the life of Joseph and draw out principles for effective management? Your life and happiness are not adequate points of reference for the scope of what God has done and is doing. Neither are mine. It’s bigger than you and me. In the Bible we are watching as redemption comes to pass on the pages of Scripture, one unbelievable event after another, eventually leading to Christ. Each page rumbles with anticipation. When you see it from here, the Bible opens up in ways you’ve never imagined. It takes off. Unfortunately, we’ve been conditioned to read ourselves onto the pages and into the events of Scripture. We don’t even realize we’re doing it. What’s the first question we ask of the Bible in our personal reading times or church services? “How is this relevant to me?” This is the wrong question entirely. No question could push us further from the real story. It’s very much like walking out into the night sky and assuming all the stars showed up to look at us. When we approach the Bible this way, we can’t help but read it as if we’re the center of the biblical universe and all of its history revolves around us. When everything is read through the lens of self, self-improvement, and self-contentment, we’re destined to miss the point. But this is what we always do. Is it any wonder most Christians—even those who care deeply about the Word of God—are unable to put it all together? Usually, biblical stories are approached as a set of isolated events with no connection to each other or to the greater redemptive plotline of the Bible. Without the real story, the events of the Bible become merely parables for better living, moral platitudes, character studies, or whatever else we can come up with. In the absence of a greater plot this is all we have. Over the years popular Christianity has practically rewritten the Bible. Our version of various events reads more like a fairy tale than God’s story. Eve’s decision to eat of the fruit and the subsequent disintegration of humanity becomes a lesson on the effects of negligent leadership and an absentee husband. Cain’s homicidal rage becomes a lesson on avoiding sibling rivalry. Abraham’s attempted sacrifice of his only son becomes a lesson in trusting against all odds for God to provide, or how we should all surrender our children to God. Moses before a burning bush becomes a prototype for decision-making. Gideon becomes an example of how to determine the will of God. The prayer of Jabez becomes a lesson about expanding our personal influence. David’s encounter with the fighting champion of a hostile nation becomes a lesson in overcoming our greatest personal challenges (“giants”). Jonah, a prophet miraculously swallowed by a fish and vomited out on a specific shoreline, becomes an example of the futility of resisting God’s purpose in your life. Jesus’ testing in the wilderness in a template for how we resist temptation. The story of a caring Samaritan is a model of how we should reach out with compassion to those of other races and classes. Smith, C. Christopher (2010-02-01). Growing Deeper in our Church Communities: 50 ideas for Connection in a Disconnected Age (Kindle Locations 1011-1017). The Englewood Review of Books. Kindle Edition. Ephesians 6:13-18 Therefore put on the full armor of God, so that when the day of evil comes, you may be able to stand your ground, and after you have done everything, to stand. Stand firm then, with the belt of truth buckled around your waist, with the breastplate of righteousness in place, and with your feet fitted with the readiness that comes from the gospel of peace. In addition to all this, take up the shield of faith, with which you can extinguish all the flaming arrows of the evil one. Take the helmet of salvation and the sword of the Spirit, which is the word of God. And pray in the Spirit on all occasions with all kinds of prayers and requests. With this in mind, be alert and always keep on praying for all the Lord’s people. I’ve been posting articles and blog entries for six or seven years now, so I’ve developed a relatively thick skin. I’ve saved all my email correspondence during this period of time to remind me of some of the responses I’ve received and to keep a record of complaints. Some people have encouraged me over the years while others have grumbled. I recognize that it’s important to evaluate and accept criticism; I try to be my own worst critic, and I am quick to adjust my thinking on a particular issue when someone offers a valid criticism. But I’ve noticed that some emailers are not interested in discussing the issues calmly or rationally, and they are unwilling to accept an alternate explanation in a non-essential doctrine. In fact, critics of this kind typically elevate their issue of interest to the level of essential Christian doctrine and refuse to accept any explanation or view that differs from their own. They consistently complain if someone strays from their favored view in even the slightest way, and their complaints quickly become vicious. They write repeatedly, post complaints on their own blogs about non-essential issues and demonstrate a lack of charity that is shocking, especially when coming from a Christian brother or sister. They continually nip at the heels of those who differ from them, barking out complaints incessantly. They become Christian Chihuahuas. I owned a Chihuahua for over ten years and often marveled at her intelligence. My dad owned a black Labrador, Woody, during this time and the apparent differences in intelligence were striking. He often complained that he couldn’t even take Woody on a run down a country road because Woody didn’t have the sense to stay away from cars that occasionally passed by. My Chihuahua, on the other hand, was smart enough to recognize the danger, but her level of intelligence caused her to be paranoid of anything she thought might hurt her. Christian Chihuahuas are often very smart people. In fact, I believe their level of uncharitable intolerance is directly proportional to their knowledge of theology and apologetics. The more someone thinks they know about a particular topic, the less likely they usually are to accept or tolerate alternative explanations. I think this is the reason Peter felt the need to admonish Christian Case Makers to make their defense with gentleness and reverence (1Peter 3:15-16); he understood the relationship between knowledge and prideful arrogance. When I first got my Chihuahua, she was a sweet, accepting dog who loved anyone who wanted to pet or pay attention to her. But as she became more and more familiar with our family and recognized that she belonged to us, she became obsessively protective. She became less and less tolerant of strangers or non-family members. It wasn’t long before she barked and growled at anyone who wasn’t a member of the family. 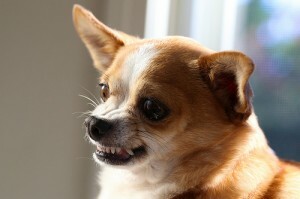 Christian Chihuahuas are similarly protective of the like-minded thinkers they call “family”. They tend to affirm one another, write blogs and posts that appeal only to people who think the same way, and viciously rush to attack anyone who might challenge a “family member” who shares their view on a nonessential issue. My Chihuahua was determined to be the biggest dog in the yard, even though she was always the smallest. She consistently over-compensated for her size by being the loudest, fiercest and un-friendliest dog in any group. It was difficult to meet with other friends who had dogs, because my Chihuahua had a hard time getting along. Christian Chihuahuas are similarly defensive, especially if they hold a view that is in the minority position. Feeling outnumbered (like the smallest dog in the yard), they are typically louder, more obnoxious, less forgiving, and less gracious. So, the questions I have for myself are simply these: Am I the Chihuahua in the room? Am I the kind of person who arrogantly thinks he has all the answers? Do I selectively cloister myself with like-minded believers? Do I obnoxiously defend what I believe with ruthless animosity? Am I more of a nuisance than a blessing? Have I elevated my pet theological positions to the level of essential Christian doctrine, even when they are non-essential issues? In the many years that I owned a Chihuahua, my friends tolerated her with patience. In fact, they usually ignored her incessant barking and posturing as they tried their best to carry on a conversation while the silly little dog was barking in the background. That’s what we do with barking Chihuahuas; we try to ignore them and carry on as though they weren’t the obnoxious little dogs they actually are. I don’t want people to feel that way about me. Sadly, I am sure there have been many times when I was the kind of nuisance people could easily ignore. So I continue to ask these questions about my own behavior and attitude as I try my best to avoid becoming a Christian Chihuahua. Sanctification, or growth as a Christian, is not entirely monergistic (involving one agent only) but synergistic (involving two or more agents). Augustine says it best, “Without God we cannot; without us God will not.” In some sense, every command issued to believers to live a holy life assumes we have the capability to carried out that command (2 Cor 7:1; 1 Thess 4:3-4; Heb 12:1; 1 Pt 1:15- 16). Yet, Scripture also insists that it is God who, by his grace, initializes and accomplishes everything that is holy in you (1 Cor 15:10; Col 1:28-29). Just as no one can take credit for their salvation, so no one can take credit for their sanctification. The same grace that saved us is the same grace that sanctifies us. At the end of the day, it is God alone who gets the glory for any spiritual progress made, though we are privileged to participate in the process. Nevertheless, our participation is not entirely passive since we are responsible to live out what God is doing in us. No passage is clearer about this synergistic model than Philip 2:12- 13. 1. Contextually, this passage has nothing to say about “getting/becoming saved.” Rather, it speaks to us who are saved and how we should walk in our salvation, particularly in the church and in the world (see, Philip 3:16-18 for the latter). 2. The phrase “working out your salvation” complements “as you have always obeyed.” In other words, Paul is exhorting the Philippians to grow in obedience (“salvation” here is tantamount to obedience). It is a call to obedient living as depicted by a life already saved. 3. “For it is God . . .” is better translated “because it is God . . .” In effect Paul is telling us that we are not left to our own resources. All of God’s gracious activity in salvation, from first to last, is accomplished by him who will “carry it on to completion” (Philip 1:6). 4. This activity of God is dynamic and ongoing. Paul sees no tension between exhorting us to do something on the one hand, and showing confidence that it is accomplished by God on the other (comp., e.g., Rom 8:12-14 with Rom 8:4). 5. Obedience is always good for us because it is God’s purpose in us, even though we don’t always know precisely how this might look (cf., Gen 22:1-18; Heb 11:8). 6. Philip 2:12-13 beautifully and unashamedly illustrates the relationship between God’s sovereignty and human responsibility. 7. The text does not say “Work to gain salvation, because God has done his part.” Or, “Perseverance depends entirely on you.” Nor does it say, “Relax! You’re one of the frozen, chosen.” Still, it does not say that God is doing the “work” for us since the command is to us to do something. 9. Hence, the ability to “work out” our salvation, though in us, is not from us. A will inclined toward God is always a product of God and never solely the result of self-determination (Jn 15:1-5). 10. Finally, coming to grips with the reality that God is mightily at work in us is anything but a disincentive. The profound significance that God’s sovereign rule over the universe will never be made contingent by the “free” choices of humans should not only inspire us at the intellectual level, but ignite in us a firm resolve at the practical level to live every waking moment for Him who died, has risen, is coming again, and empowers our will for his glory at every turn! To this we were called. For this we are chosen. By this we are empowered.